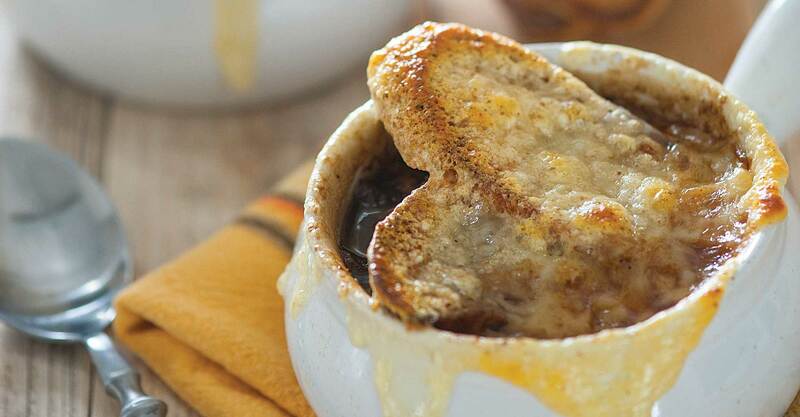 There’s more comforting on a chilly fall day than a hot bowl of onion soup—especially when it’s laced with your favorite stout. Peel and slice the onions into 1/8-inch (3-mm) slices (a julienne cut). In a large heavy-bottom pan over medium heat, melt the butter. Add the onions and cook slowly for 25–30 minutes, stirring often until they reach a dark caramel color. Add the garlic, bay leaf, and thyme to the pan. Add the beer to the pan and bring to a boil. Add the beef broth and reduce heat to a simmer. Simmer for 10 minutes. Season to taste with salt and pepper. Preheat the broiler to high. Arrange four ovenproof soup bowls on a sheet pan. Ladle the soup into the bowls. Lay a slice of bread on top of each bowl of soup. Top evenly with the cheese. Place the sheet pan carefully under the broiler. Broil until bubbling and browned.